I'm sort cheating this month as I can't really post on the chosen theme (the City DailyPhoto blog community votes every month to choose the topic). I've never really seen grafitti around Sharon - I don't know if people just don't do it, or it's cleaned up quickly, or I'm not being observant enough. But instead, I'm showing you a different kind of street art - the street paintings made at the Family Arts Festival in Millerton last summer. I wish we had this kind of street art though. I love seeing them. We don't have much graffiti here on Maui either, so I really had to search to find one! Happy Theme Day! Good resolution of the theme. I like whimsical stencil street art/graffiti .and murals rathe rthna the tag-type graffiti. But I like the impermanence of it. It's very urban I guess! Green Boy thinks so anyway! I think, as I told Denton, that no graffiti is a godsend, but I'm surprised that there aren't any murals since they're wonderful examples of street art. Your choices qualify, tho!! That's a great post, nonetheless. Sidewalk chalk art is one of my favorite forms of street art and the ones you are featuring today are lovely. It's nice to see the people who create them at work, too. nice photo, and a wonderful choice. we don't have much 'graffiti' around here either, and i think your idea is a much more positive spin on the theme! Woah, Jenny! 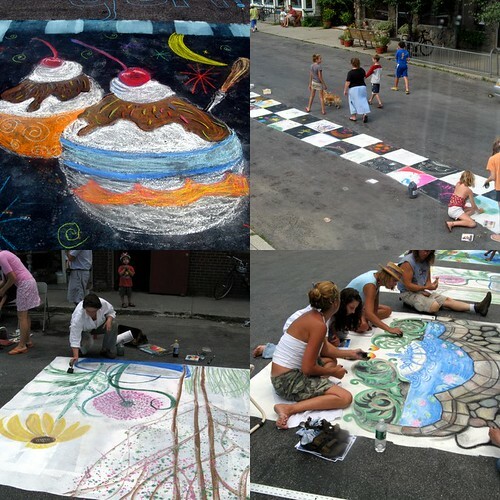 Leave it to you to literally bring us street murals! Fantastic post, and very original of the 20 or so I've seen so far. What's magical about these is their transient quality which makes us better appreciate the time, work, and effort of people that know this will all go away, despite how hard they work. Good idea, I'm sorry I didn't get it for myselff. I had a nice pic of the children of my son drawing the French flag on the street with chalk just before the football final Italy-France 2 years ago. I remember one of these from you and thought they were wonderful then and they are still wonderful now! Great scene. Truly street murals when they are painted on the street. Lucky you...we have way too much graffiti. I love your choices, and especially your highlighting of creative artists at work. lovely - can't add much more as everyone has already said it. I don't know if it's still there, Jenny, but there used to be graffiti on one of those concrete underpasses that goes under the HV Rail Trail outside Millerton. Perhaps over Downey Rd. But my recollection is it's really bourgeois graffiti that says something like "Satan Rules." Hardly worth the effort. Nice! It's fun really good to see those! I love the collage. maybe someone in Sharon would be inspired to paint a wall after they've read your post. Now, this is what I call STREET art. Really fun to watch. Some of them are really good painters. that actually looks tasty! really! now, what flavor is that ice cream?